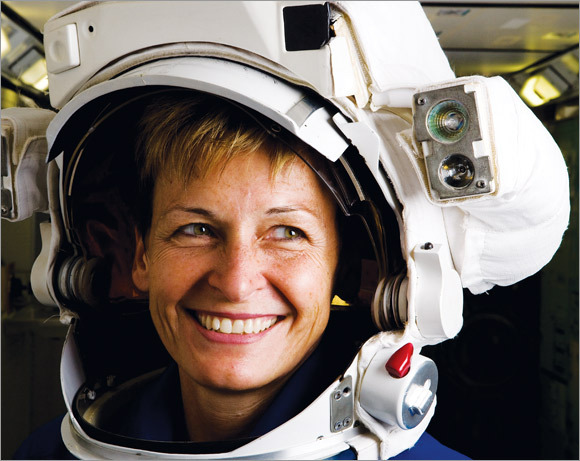 This year Peggy Whitson made history in three different ways. First she became the oldest woman to fly into space. Second, she became the first woman to command the International Space Center twice. And third, she broke the record for the amount of time spent in space by a U.S. astronaut. Peggy earned her bachelor’s degree in biology and chemistry from Iowa Wesleyan College. She then earned her doctorate degree in biochemistry from Rice University. After spending time there as a Postdoctoral fellow, she began working at the Johnson Space Center in Houston. Peggy held a variety of positions at NASA including research biochemist, technical monitor and payload element developer. At the same time she was also an assistant professor at the University of Texas. In 1996 Peggy began training as an astronaut. Once she successfully completed the training she held many different technical positions. Her first trip into space took place in 2002 when she spent six months at the International Space Station (ISS). Her second mission lasted for 191 days. During the mission she was commander of the International Space Station. This was a historic moment as she was the first woman ever given this role. Peggy was named Chief of the Astronaut Office – this put her in charge of mission preparation for all trips to the ISS. This was a role she held until 2012. She decided that she wanted to go back into space and so began preparing for a third mission. That mission took place in November of this year. Aged 56 she became the oldest woman to travel into space. By the end of the mission she will have set a new record for the most amount of time spent in space by a U.S. astronaut – male or female. Peggy has shown that if you are passionate, determined and work hard you can achieve your dream – irrespective of your age.